This is not a surprising move. Volkswagen is currently pushing crossovers in the US like never before, specifically its all-new three-row Atlas and redesigned Tiguan. However, the Touareg will no longer be part of that campaign. VW has made it official that the Touareg will not return for the 2018 model year, although it appears it’ll still be sold in some overseas markets. First launched in the US in 2004, the Touareg has always been well-regarded for its build quality, carlike ride, and solid handling. Unlike many of today’s crossovers, it also had sufficient ground clearance and four-wheel-drive for off-road adventures. Interior cargo space was also more than enough for most. Despite being somewhat out-of-date, perhaps the Touareg’s biggest issue is its price tag, which starts at just over $50,000. That’s an awful lot for a two-row SUV and it’s certainly out of price range for a lot of American families. 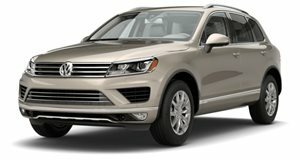 VW doesn’t have immediate plans to replace the Touareg because the new Tiguan should be able to fill the gap. Not only is the Tiguan less expensive, but it’s also longer and offers even more cargo space. Touareg sales also haven’t exactly been stellar. VW reports just 1,630 units sold since the beginning of this year. During the same time, 20,556 Tiguans were sold. VW’s decision to drop the US market Touareg is also good timing because of plans to launch, in the very near future, an extensive EV lineup. In addition, the T-Roc small crossover is also on its way. Goodbye, Volkswagen Touareg. You were a great but overpriced SUV.